Southern California includes the heavily built-up urban area which stretches along the Pacific coast from Ventura through Greater Los Angeles down to Greater San Diego (the contiguous urban area in fact continuing into Tijuana, Mexico), and inland to the Inland Empire and Coachella Valley (Palm Springs area). It encompasses eight metropolitan areas (MSAs), three of which together form the Greater Los Angeles Combined Statistical Area (CSA) with over 18 million people, the second-biggest CSA after the New York CSA. These three MSAs are: the Los Angeles metropolitan area (Los Angeles and Orange counties, with 13.3 million people), the Inland Empire ((Riverside and San Bernardino counties, including the Coachella Valley cities, with 4.3 million people), and the Oxnard–Thousand Oaks–Ventura metropolitan area (0.8 million people). In addition, Southern California contains the San Diego metropolitan area with 3.3 million people, Bakersfield metro area with 0.9 million, and the Santa Barbara, San Luis Obispo, and El Centro (Imperial County) metropolitan areas. The Southern California Megaregion (or megalopolis) is larger still, extending east into Las Vegas, Nevada and south across the Mexican border into Tijuana. The motion picture, television, and music industry are centered in the Los Angeles area in southern California. Hollywood, a district of Los Angeles, gives its name to the American motion picture industry, which is synonymous with the neighborhood name. 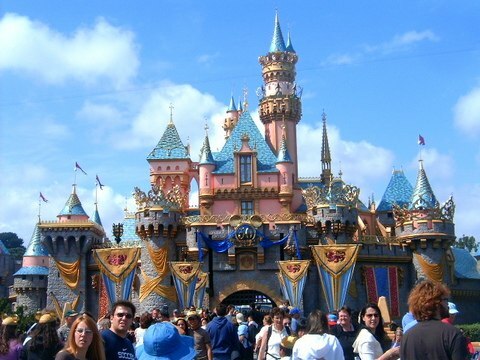 Headquartered in southern California are The Walt Disney Company (which owns ABC), Sony Pictures, Universal Pictures, MGM, Paramount Pictures, 20th Century Fox, and Warner Bros. Universal, Warner Bros., and Sony also run major record companies. Southern California was the name of a proposed new state on the 2018 California ballot created by splitting the existing state into three parts. The hypothetical state would exclude the coastal counties north of Orange County but include inland counties as far north as Inyo County. The Downtown Los Angeles skyline seen at sunset on an October day. At 1,018 feet (310 m), 73 floors, the U.S. Bank Tower was the West Coast's tallest building when it was built in 1989. The climate is Mediterranean-Like, with Warm/dry Summers, Mild/wet Winters, where cool weather and freezing temperatures are rare. Southern California contains several different types of climate, including Mediterranean, semi-arid, desert and mountain, with infrequent rain and many sunny days. Summers are hot or warm, and dry, while winters are mild, and rainfall is low to moderate depending on the area. Although heavy rain can occur, it is unusual. This climatic pattern was alluded to in the hit song "It Never Rains (In Southern California)". While snow is very rare in the southwest region of the state, it occurs occasionally in the southeast region of the state. Southern California is home to many major business districts. Central business districts (CBD) include Downtown Los Angeles, Downtown San Diego, Downtown San Bernardino and South Coast Metro. Within the Los Angeles Area are the major business districts of Downtown Pasadena, Downtown Burbank, Downtown Santa Monica, Downtown Glendale and Downtown Long Beach. Los Angeles itself has many business districts, such as Downtown Los Angeles and those lining the Wilshire Boulevard Miracle Mile, including Century City, Westwood, and Warner Center in the San Fernando Valley. The area of Santa Monica and Venice (and perhaps some of Culver City) is informally referred to as "Silicon Beach" because of the concentration of financial and marketing technology-centric firms located in the region. Southern California also is home to a number of popular NCAA sports programs such as the UCLA Bruins, the USC Trojans, and the San Diego State Aztecs. The Bruins and the Trojans both field football teams in NCAA Division I in the Pac-12 Conference, and there is a longtime rivalry between the schools. ^ a b "Figures Show California's Motoring Supremacy". Touring Topics. Los Angeles, California: Automobile Club of Southern California. 8 (2): 38–9. March 1916. ^ Cooley, Timothy J. (2014). Surfing about Music. University of California Press. p. 46. ISBN 9780520957213. ^ "Megaregions". Retrieved October 1, 2014. ^ "California County Population Estimates" (PDF). California Department of Finance. January 7, 2009. Archived from the original (PDF) on March 29, 2012. Retrieved October 17, 2016. ^ Higgins, Matt (September 13, 2006). "Construction Stirs Debate on Effects on 'Perfect Wave'". The New York Times. Retrieved September 13, 2008. ^ DiLeo, Michael; Smith, Eleanor (1983). Two Californias: The Myths And Realities Of A State Divided Against Itself. Covelo, California: Island Press. p. 30. ISBN 9780933280168. Retrieved October 17, 2016. ^ California, Historical Society of Southern; California, Los Angeles County Pioneers of Southern (1901). The Quarterly. Retrieved October 17, 2016. ^ Bernstein, Leilah (December 31, 1999). "L.A. Then AND NOW". Los Angeles Times. Archived from the original on February 27, 2017. Retrieved February 27, 2017. ^ Myers, John. "Radical plan to split California into three states earns spot on November ballot". latimes.com. Retrieved June 14, 2018. ^ "USGS facts". data from southern California Earthquake Center. Archived from the original on February 26, 2009. Retrieved March 18, 2009. ^ "Northridge Earthquake". 2005. Archived from the original on July 12, 2006. Retrieved December 11, 2013. ^ "UCERF3: A New Earthquake Forecast for California's Complex Fault System" (PDF). USGS. March 3, 2015. Retrieved October 17, 2016. ^ "Annual Estimates of the Population of Combined Statistical Areas: April 1, 2000 to July 1, 2009". 2009 Population Estimates. United States Census Bureau, Population Division. March 23, 2010. Archived from the original (CSV) on March 27, 2010. Retrieved March 29, 2010. ^ "World Gazetteer; San Diego-Tijuana". World Gazetteer. Archived from the original on October 1, 2007. Retrieved March 20, 2011. ^ Loucky, James, ed. (2008). Transboundary policy challenges in the Pacific border regions of North America. University of Calgary Press. p. 8. ISBN 1-55238-223-0. Retrieved February 19, 2011. ^ "Calendar Year 2011 Primary Airports" (PDF). September 27, 2012. Retrieved October 17, 2016. The College World Series (CWS) is an annual June baseball tournament held in Omaha, Nebraska. The CWS is the culmination of the National Collegiate Athletic Association (NCAA) Division I Baseball Championship tournament—featuring 64 teams in the first round—which determines the NCAA Division I college baseball champion. The eight participating teams are split into two, four-team, double-elimination brackets, with the winners of each bracket playing in a best-of-three championship series. The kit fox (Vulpes macrotis) is a fox species of North America. Its range is primarily in the Southwestern United States and northern and central Mexico. Some mammalogists classify it as conspecific with the swift fox, V. velox, but molecular systematics imply that the two species are distinct. The LA84 Foundation (known until June 2007 as the Amateur Athletic Foundation of Los Angeles) is a private, nonprofit institution created by the Los Angeles Olympic Organizing Committee to manage Southern California's endowment from the 1984 Olympic Games. Under an agreement made in 1979, 40 percent of any surplus was to stay in Southern California, with the other 60 percent going to the United States Olympic Committee. The total surplus was $232.5 million. Southern California's share was approximately $93 million. The LA84 Foundation's mission is to promote and expand youth sports opportunities in Southern California and to increase knowledge of sport and its impact on people's lives. Since inception, the Foundation has invested more than $225 million in Southern California by awarding grants to youth sports organizations, initiating sports and coaching education programs, and operating the world's premier sports library.Grants are awarded to organizations that provide on-going, structured youth sports programs combining the essential elements of teaching, learning and competition. The Foundation makes grants in the eight southernmost counties of California (Imperial, Los Angeles, Orange, Riverside, San Bernardino, San Diego, Santa Barbara and Ventura). Youth organizations in the Los Angeles area receive priority. The LA84 Foundation has made grants to more than 1,100 Southern California organizations since 1985. The LA84 Foundation has initiated programs to meet the youth sports needs of Southern California and to create models that can be applied elsewhere. These include the LA84 Foundation Coaching Education Program as well as large-scale sports programs such as Summer Swim and Run 4 Fun, which serve nearly 20,000 children and teenagers each year. The Foundation's headquarters is the historic Eugene W. Britt House, a Registered Historic Place located at 2141 West Adams Boulevard in Los Angeles' Jefferson Park neighborhood. It was formerly a sports museum that featured the Helms Athletic Foundation's collection of sports books, film, photographs and memorabilia. First Interstate Bank and the Peter and Ginny Ueberroth Foundation donated the Helms Collection, house and grounds to the LA84 Foundation in the summer of 1985. The Paul Ziffren Sports Resource Center houses the world's premier sports library. The library maintains an extensive collection of books, periodicals, photograph and moving footage, with a special emphasis on the Olympic Games. The traditional library has been supplemented by the development of an extensive electronic collection of 100,000 PDFs including scholarly publications, popular magazine and primary historical documents available at no cost on the LA84 Foundation website. The LA84 Foundation also hosts conferences and sponsors research on a variety of sport topics. The LA84 Foundations practical knowledge, acquired through years of direct involvement in youth sports, combined with its wide range of education services enables the Foundation to serve as a leading forum for the exchange of ideas and exploration of issues in sport. In June 2007, the Foundation adopted the name LA84 Foundation to establish a unique identity and honor the spirit of the 1984 Olympic Games, which created the Foundation's endowment. The swimming stadium used for the 1932 Olympic Games has been renamed the LA84 Foundation/John C. Argue Swim Stadium. Argue was instrumental in bringing the 1984 Olympic Games to Los Angeles. He later served as chair of the LA84 Foundation. Metrolink (reporting mark SCAX) is a commuter rail system in Southern California consisting of seven lines and 62 stations operating on 534 miles (859 km) of rail network.The system operates in Los Angeles, Orange, Riverside, San Bernardino, and Ventura counties, as well as to Oceanside in San Diego County. It connects with the Los Angeles County Metro Rail and Metro Busway system, the San Diego Coaster commuter rail and Sprinter light rail services, and with Amtrak's Pacific Surfliner, Coast Starlight, Southwest Chief, and Sunset Limited intercity rail services.The system, founded in 1991 as the Southern California Regional Rail Authority (SCRRA) and adopting "Metrolink" as its moniker, started operation in 1992. Average weekday ridership was 39,838 as of 2017. 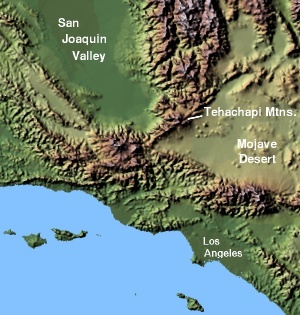 The Peninsular Ranges (also called the Lower California province) are a group of mountain ranges that stretch 1,500 km (930 mi) from Southern California to the southern tip of the Baja California Peninsula; they are part of the North American Coast Ranges, which run along the Pacific Coast from Alaska to Mexico. Elevations range from 500 to 10,834 feet (152 to 3,302 m). The San Andreas Fault is a continental transform fault that extends roughly 1,200 kilometers (750 mi) through California. It forms the tectonic boundary between the Pacific Plate and the North American Plate, and its motion is right-lateral strike-slip (horizontal). The fault divides into three segments, each with different characteristics and a different degree of earthquake risk. The slip rate along the fault ranges from 20 to 35 mm (0.79 to 1.38 in)/yr.The fault was identified in 1895 by Professor Andrew Lawson of UC Berkeley, who discovered the northern zone. It is often described as having been named after San Andreas Lake, a small body of water that was formed in a valley between the two plates. However, according to some of his reports from 1895 and 1908, Lawson actually named it after the surrounding San Andreas Valley. Following the 1906 San Francisco earthquake, Lawson concluded that the fault extended all the way into southern California. In 1953, geologist Thomas Dibblee concluded that hundreds of miles of lateral movement could occur along the fault. A project called the San Andreas Fault Observatory at Depth (SAFOD) near Parkfield, Monterey County, was drilled through the fault during 2004 – 2007 to collect material and make physical and chemical observations to better understand fault behavior. San Miguel Mountain is a mountain located in Chula Vista, California. It is 2,567' high, and is the 84th highest peak in San Diego County.Because San Miguel is "the highest point close in to the San Diego metro area" it has been home to radio and TV transmitters since the 1960s. Southern California Edison (SCE) still owns all of its electrical transmission facilities and equipment, but the deregulation of California's electricity market in the late 1990s forced the company to sell many of its power plants, though some were probably sold by choice. In California, SCE retained only its hydroelectric plants, totaling about 1,200 MW, and its 75% share of the 2,150-MW San Onofre Nuclear Generating Station, which has been shut down since January 2012; in June 2013 the company announced its intention to permanently close and decommission the nuclear plant. Also, SCE still owns about half of the 1,580-MW coal-fired Mohave Generating Station in Laughlin, Nevada, which supplied electricity to California, Nevada, and Arizona; Mohave closed in December 2005, amid concerns regarding water rights and coal supplies. The utility lost all of its natural gas-fired plants, which provided most of its electrical generation. The large, aging plants were bought by out-of-state companies such as Mirant and Reliant Energy, which allegedly used them to manipulate the California energy market.Southern California Edison's power grid is linked to PG&E's by the Path 26 wires that generally follow Interstate 5 over Tejon Pass. The interconnection takes place at a massive substation at Buttonwillow. PG&E's and WAPA's Path 15 and Path 66, respectively, from Buttonwillow north eventually connect to BPA's grid in the Pacific Northwest. There are several other interconnections with local and out-of-state utilities, such as Path 46. The Southern California Intercollegiate Athletic Conference (SCIAC) is a college athletic conference that operates in the NCAA's Division III. The conference was founded in 1915 and it consists of twelve small private schools that are located in Southern California and organized into nine athletic programs. Claremont-Mudd-Scripps and Pomona-Pitzer are combined teams for sports purposes. The SCIAC currently sponsors men's baseball, men's and women's basketball, men's and women's cross country, football, men's and women's golf, women's lacrosse, men's and women's soccer, softball, men's and women's swimming and diving, men's and women's tennis, men's and women's track and field, women's volleyball and men's and women's water polo. Ultimate Pro Wrestling (UPW) was a California-based independent pro wrestling company owned and operated by Rick Bassman, that operated from 1999 to 2007. The company had working relationships with Pro Wrestling Zero1 and World Wrestling Entertainment. It served as a developmental company for WWE, where they would scout wrestlers and send others for training, from 2006 to 2007. Some of the major names to go on to stardom are, John Cena, Samoa Joe, The Miz and Christopher Daniels. The promotion was featured on a Discovery Channel special called Inside Pro Wrestling School. Van Halen is a Grammy Award-winning American hard rock band formed in Pasadena, California in 1972. Credited with "restoring hard rock to the forefront of the music scene", Van Halen is known for its energetic live shows and for the work of its acclaimed lead guitarist, Eddie Van Halen. The band was inducted into the Rock and Roll Hall of Fame in 2007. From 1974 until 1985, Van Halen consisted of Eddie Van Halen; Eddie's brother, drummer Alex Van Halen; vocalist David Lee Roth; and bassist Michael Anthony. Upon its release, the band's self-titled debut album reached No. 19 on the Billboard pop music charts. By the early 1980s, Van Halen was one of the most successful rock acts of the time. The album 1984 was a hit; its lead single, "Jump", is the band's only U.S. number one single to date and was internationally known. In 1985, Van Halen replaced Roth with former Montrose lead vocalist Sammy Hagar. With Hagar, the group would release four U.S. number-one albums over the course of 11 years (5150 in 1986, OU812 in 1988, For Unlawful Carnal Knowledge in 1991, and Balance in 1995). Hagar left the band in 1996 shortly before the release of the band's first greatest hits collection, Best Of – Volume I. Former Extreme frontman Gary Cherone replaced Hagar, remaining with the band until 1999; Van Halen then went on hiatus until reuniting with Hagar for a worldwide tour in 2003. The following year, the band released The Best of Both Worlds, its second greatest hits collection. Hagar again left Van Halen in 2005; in 2006, Roth returned as lead vocalist. Anthony was fired from the band in 2006 and was replaced on bass guitar by Wolfgang Van Halen, Eddie's son. In 2012, the band released the commercially and critically successful A Different Kind of Truth. As of March 2019, Van Halen is 20th on the RIAA list of best-selling artists in the United States; the band has sold 56 million albums in the States and more than 80 million worldwide. As of 2007, Van Halen was one of only five rock bands with two studio albums that sold more than 10 million copies in the United States. Additionally, Van Halen has charted 13 number-one hits in the history of Billboard's Mainstream Rock chart. VH1 ranked the band seventh on a list of the top 100 hard rock artists of all time. Vanguard University of Southern California is an accredited, private, non-profit Christian university of liberal arts and professional studies in Costa Mesa, California, United States. Vanguard University was the first-four year college in Orange County and offers over 30 undergraduate degrees and emphases in 15 different departments. Vanguard University also offers adult-learning programs in its professional studies department and features six graduate degrees. It is accredited by the Western Association of Schools and Colleges (WASC).